Real Player is needed to view the video clips. You can download the player for free by clicking on the logo. "PAOLI MEAT" is unique. It can be used in any way conventional meat is used. 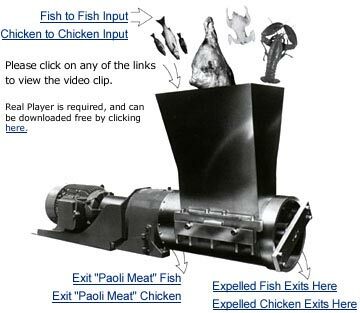 "PAOLI MEAT" exhibits exceptional bind with excellent Moisture and protein retention. Turn on power. Feed (automatically or manually) material to be deboned and/or desinewed into the hopper. "One-Step" does it from there quickly and effectively hour after hour, day after day. Assemble or disassemble in just 5 minutes. Hose down and clean-up are quick and easy. "One-Steps" are virtually maintenance free. Fewer parts mean fewer problems. "One-Steps" contain no parts which required sharpening, ever! Call, email, or fax us for details. Quick Breakdown and Assembly - Click here to watch!